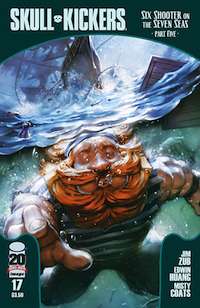 Skullkickers is a relatively new series from Image that has quickly found an audience and built a buzz. 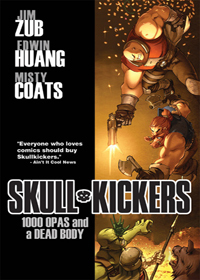 Their first trade paperback collection, “1000 Opas and a Dead Body”, collects the first storyline and their earlier appearances in the Image comics anthology Popgun. 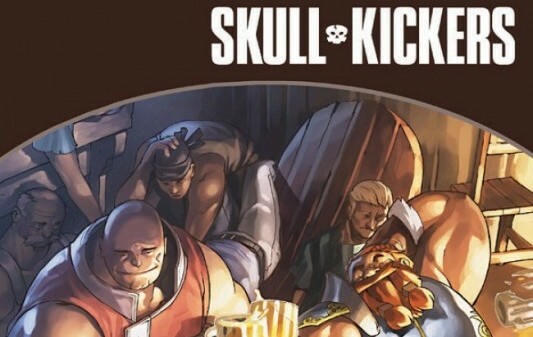 Skullkickers follows the infamous exploits of two unnamed bounty hunters, a short, rude dwarf and a giant bald fellow who we shall refer to as “Dwarf and Big Guy”. They are fighting a werewolf and breaking up a cult. Later we learn that they are performing these acts for a fee. 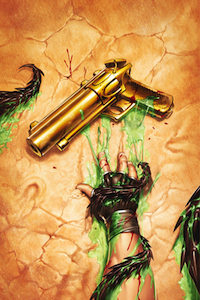 Soon after disposing of the werewolf, they witness the murder of a chancellor. The chancellor’s associates pay them 1000 opas to bring the killer to justice. 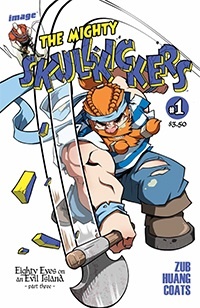 Of course, what seems like a simple jobs becomes a madcap adventure that involves demons, gypsies, monsters, and the fate of an entire kingdom.